There's no denying that Facebook is enormously popular, with over one billion members. But it's also enormously frustrating and annoying sometimes. Some things are hidden or hard to find. Others just won't go away. Navigating the ever-changing interface is daunting. What if you could fix all that with just a few clicks? Read on to learn how…. Social Fixer to the Rescue! If you use Facebook at all, you've probably encountered some of most common annoyances, and wondered "Why in the world does it do THAT?" or "Why can't I just do THIS?" Then you probably resigned yourself to the fact that there's nothing you can do to change Facebook. What programmer born and trained anywhere on Earth would make the Enter key the Submit key in a comment box? This is why many Facebook comments lack proper paragraphing and are difficult to read, or end in the middle of a sentence. Who but a malevolent space monster would make notification pop-ups appear in the lower left corner, right over the window in which one is writing a comment? And you cannot turn off those pop-ups or move them out of the way; there, I just saved you an hour of wasted time in Facebook’s unhelpful “help” system. It’s a browser add-on available for Chrome, Firefox, Safari, Opera, and even Grease Monkey. But not for Internet Explorer, because Microsoft makes third-party add-ons difficult. There's a good reason to switch, if you still use IE. How Does Social Fixer Improve Facebook? Force the Enter key to be Newline in comments, so you don't prematurely send your unfinished comment. Make the news feed show "Recent Stories First". Tabbed News Feeds -- Posts from Facebook's most popular games and applications will be separated into their own tabs, so you needn't be bothered with this trivia unless you want to see it. Advanced Feed Filters -- give you control over what stories you want to see or hide, by moving stories to separate tabs, based on rules you create. The ability to mark posts as read, so you don't have to keep scrolling past things you've already seen. Show only your online friends in the chat list (rather than whoever Facebook picks to show). Change font size used in comments. Enlarge Thumbnails On Hover -- Place your mouse over an image in on your timeline, and the full-sized photo will appear in a popup. Friend Tracker – Get notified when someone unfriends you. Pin the Notifications window to right side of the screen. The death of that notification pop-up alone is worth a tip. Many other small but precious graces are granted by SocialFixer. And it's customizable, so you can turn most features on or off, depending on how you want to personalize your Facebook experience. Did I mention that Social Fixer is free? Yes, Kruse requests a modest donation if you use the software and find it helpful. But that's optional. I would highly recommend it, though, because Kruse provides Social Fixer as a labor of love. He's got a family and a regular day job. People like him, who provide free high quality stuff online, should be encouraged. I want to share an example of how dedicated and generous this guy is. Yesterday, I had to run System Restore to fix a problem on my laptop. Afterwards, Social Fixer no longer worked, even after re-installing the software. I appealed to Matt Kruse via Facebook at 6:26 p.m. Pacific time. His response arrived at 9:40 p.m. (10:40 Matt’s time). He sent a link to a page of potential solutions, all clearly written and easily followed step by step, with screenshots. I had my precious Social Fixer back in ten minutes flat. So I tipped him again via Paypal. Here's another good reason to toss something into the Social Fixer tip jar. Kruse was recently smacked down by Facebook, who claimed that he somehow "violated community standards" by having a page and support group on Facebook that helps people enjoy Facebook more. His Social Fixer page, which had over 300,000 "likes" was deleted without any notice along with his support group. Social Fixer will continue on, but it'll be harder for Kruse to communicate with those who want information and support. I think you'll find it a very useful tool. Not since Prodigy stopped advertising on TV have I used the cliche’, “You just gotta try this thing!” But you do. Most recent comments on "How to Fix Facebook Annoyances"
FB can be fixed by only one thing - its complete and utter deletion from the world. I will go and add this right now. Thanks for sharing it! It is a crying shame that the powers that be on FB are so hostile, they're also hostile to religious (Christian) and conservative thought. Kirk Cameron's movie, "Unstoppable" had a page with thousands of followers and it is now deleted from the site. Second amendment supporter pages are also targets (pun intended) of the FB deleters. But you should know there's a way around the submit/enter problem. That's to hit control/enter and it makes you a paragraph space. Also don't forget you can edit comments and delete them too! Another annoyance is that whilst you CAN edit comments, you CANNOT edit your posts. And that's a problem if you don't just write one sentence. If you need to amend your post you have to copy it, then delete, then paste the text into a new post box, and make your amendments. I don't see that Social Fixer has that feature, in your listing of its features. Does Social Fixer let you edit your posts without having to do all that? I believe that Facebook has deleted the Facebook Social Fixer page because they don't like folks doing an end-run on their "code kingdom." Next step: people who use Social Fixer will be shut down or they will have to pay to use it. Check it out! By far the easiest fix is to not sign up for FB in the first place. If you are like me and did sign up, then close the account. Closing the account will not necessarily get rid of FB annoyances entirely. For several years I still got a few random emails from FB. I tried to stop them but of course FB would not let me communicate with them until I signed in. The account could not be signed into because I had closed it. Finally I complained to the FCC. That seemed to do the trick. About a month before FB's IPO I started to get somewhat frequent emails from FB again. After the IPO they stopped. I have a pretty good idea what was happening with that. When I first saw the title of your post, I thought it was going to be about making FB not such a sinkhole. What's wrong with a little face-to-face interaction. I have to agree with David: complete and utter deletion is the only way to fix FB. I installed the app and my Facebook news feed has completely disappeared. I have tried everything, including uninstalling the app, but nothing is working. The new Social Fixer support group Facebook page is also not working. What a mess! EDITOR'S NOTE: System Restore should get you back to good, if restarting the browser and/or computer doesn't help. Sounds good, I might have a look! But will it fix FB's total, determined ignorance of geography? Staveley and Kendal are in Cumbria (UK) but FB offers only Lancashire and Indonesia. I have the emails saying they're looking into it from 2010 on. Buy a bloody map Zucks! I have used Social Fixer for quite some time now and almost have forgotten how unfriendly FB can be. Kudos to Matt for helping to make this software more friendly and useful! Now if we can just get Apple to let people do the same with their iPhones and iPads instead of forcing us to use a jailbreak to make these devices more friendly. I uninstalled the app, restarted my computer and FB eventually, gradually returned to normal. The people on Matt Kruse's FB support page did nothing but insult me when I suggested they make their app work with FB. They said it was FB's problem, not theirs. My question is, if you can't make a FB app that's supposed to work with FB, why blame that on FB? Anyway, they threw me off their page. Just thought you'd like to know. Now, I'm trying to get my money back. Wish me luck. Awesome to see my favorite tech guy showing the love for the best FB app there is! I've been a reader of Bob Rankin since the Tour Bus days and subscribe to the Ask Bob. Matt Kruse is a hero for what he has done with SocialFixer and Facebook has no grounds for what they did. If they were honest they would have to admit to the features they did add that Matt and the rest of us were using all along! Thanks again Bob. Great little addon. I played around with it for about 15 minutes and already have a need looking new interface. I will continue to play around with it to really tweak it the way I want it. I love everything about it so far. Well done for helping promote such a well designed and useful tool. Matt and the team of volunteers deserve nothing but praise for the time they put into SF. As for the Facebook haters; if you don't like it, don't use it. There's no need to register your hatred everyone someone mentions it because you have issues with it. It happens to be a handy way of keeping in touch with family and friends without the costs incurred with calling several people at once across the globe (for instance), and if you really have nothing good to say to without reason then you should keep your thoughts to yourself as they are neither helpful nor productive; do you stand on street corners shouting at cars that aren't your favorite colo(u)r too? Safari was unable to download on my IPad? 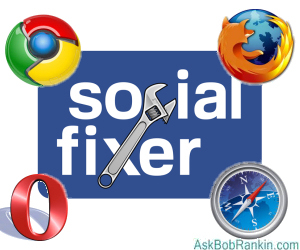 I down-loaded and installed the Mozilla Firefox version of Social Fixer. I liked the ability to turn off the chat crawl on the right side of the screen and the ability to set the display to the window width, I liked that it can make FB display the feed in chronological order and the ability to mark something as read. I turned on the tabs and I just don't get how that works. It is not as intuitive as I hoped it would be. It seems like it has a mind of its own as to what tabs should be created and what should be in those tabs. I was at a loss as to how to tell it that I did not want an item to be in the tab in which it had automatically been placed. I also noticed (which left a negative impression) that, when reading items in a tab which it had created (and put most of my feed into), I could not 'like' items in that tab. I was too tired at the time, it being late, to investigate how the tabbing feature is controlled or if I even have any say in what it does, so I just disabled the whole thing (interestingly the chat crawl is still off after disabling Social Fixer). I was less than impressed that I had to restart the browser to enable and disable this add-on. Perhaps I will investigate it further later. "Who but a malevolent space monster would make notification pop-ups appear in the lower left corner, right over the window in which one is writing a comment?" That was my idea (in the Social Fixer forum) and, as he does with many suggestions, Matt said 'great idea!' and made it happen. Give this man your money. Will Robinson - Perhaps I didn't express myself clearly. I installed the app, it worked fine for an hour or so, then my newsfeed disppeared, I uninstalled the app completely, I re-started my computer, my FB newsfeed re-appeared about 15 minutes later. I think the problem with Facebook and other social media is the annoying things people do there. Annoyances really have to go.